These Monster Brownies taste like what I would imagine if a brownie and a monster cookie had a love child, but only better. Last night at church our young women’s group had a fundraiser, a variety show and baked goods auction. When I found out about this event a few weeks ago, I immediately thought of Monster Magic Cookie Bars, by Something Swanky. I knew I wanted to do some variation of this dessert, but it wasn’t until last week that I decided it would be a brownie based treat. Oh.me.oh.my. You are going to want to make these Monster Brownies for sure. If I was asked to describe this concoction I would say, “They’re like if a brownie and a monster cookie had a love child, only better.” That is of course if sweets could marry and have delicious offspring of their own. I guess the point I am trying to get across it that I loved theses brownies! They are sweet, moist, crunchy, satisfying morsels of make oneself feel guilty for wanting to eat the whole pan kind of good. Whether you are searching for a brownie a little out of the ordinary or just in need of some chocolate, I highly recommend making these soon. You can switch up the topping in infinite combinations to suit your mood, enjoy and happy baking! Preheat your oven to 350º, prepare a 9"x13" baking pan with cooking spray and set aside. In a large bowl combine the sugar, vanilla, water, eggs and butter. In another large bowl whisk together the cocoa powder, flour, baking powder and salt. Mix the wet ingredients in to the dry just until moistened. Spread the batter into the pan and bake for 20 minutes. Remove the pan from the oven, drizzle on the milk and press the toppings lightly into the surface. Return pan to oven and bake for an additional 15-20 minutes, depending on your preference of gooeyness. Cool, slice and serve warm with milk or vanilla ice cream. This must be very tasty! oh my, these are monstrous! 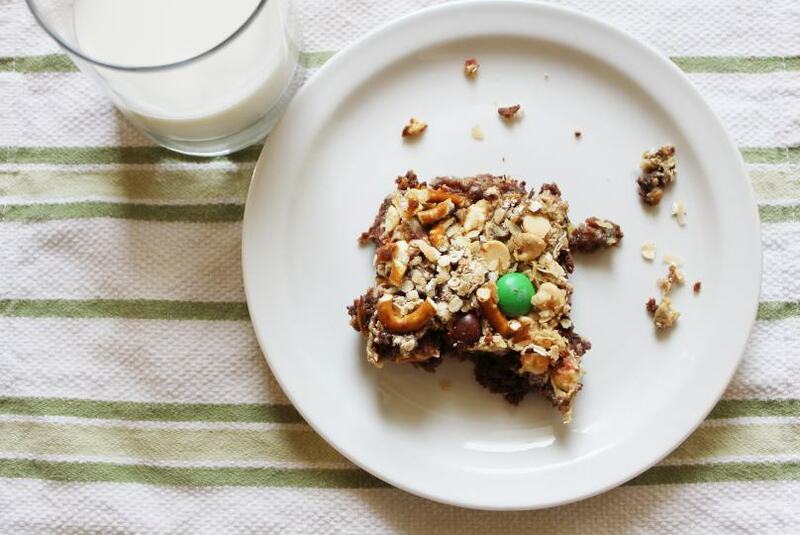 i just made a monster cookie that was fun for the kiddos, but these look positively sinful! 🙂 Pinning!!!! ohmygoodness those look amazing! Hmmm, I have to make these soon. PS Your photos are gorgeous! These look yummy! I’m going to pass the recipe along to my daughter…she does all the baking in our house! Oh wow! Those really have something for everyone, don’t they!! I know a granddaughter who would love one of these. Thanks for the post. Enjoy your SITS Day. My kids are going to love these! Stopping by from SITS!